The New Moon on December 21st falls at 0 degrees of cautious, conservative Capricorn. This is the Last New Moon of 2014 and it comes with a sobering influence. It falls on the Winter Solstice and Yule, marking the longest night. It also comes just a few days after the latest spat between Uranus and Pluto which has been shaking us up since 2012. At this time, many planets are in the sign of the Goat. Mercury, keeping our thoughts and minds on the things that matter, Venus, having us conserving our money and appreciating persons and things of quality rather than quantity and perhaps enjoying traditions. Venus is also very close to Pluto and square Uranus at the time of this New Moon and it is possible we are changing our value structure and perhaps quite suddenly. It could be that finances are unstable or that the market in general is very unpredictable now. Venus also rules over relationships so perhaps it is in this area that you experience changes and excitement to say the least. Vesta is also in Capricorn keeping us dedicated, disciplined and focused. We are serious about commitments now. In fact, we can start our resolutions for 2015 at this New Moon instead of waiting until January. There is even more big planetary news helping to further emphasize this theme of conservative cautiousness. Saturn, the ruler of Capricorn, will move out of Scorpio’s murky depths where he’s been since October 2012, (you can read about Saturn in Scorpio) http://www.spellboundreading.net/blog/2013/07/13/Saturn-in-Scorpio.aspx and into expansive Sagittarius. Your world may seem a bit smaller with this influence. Saturn in Sagittarius automatically tells us to curb our enthusiasm. We may be required to pull back wherever we’ve overextended ourselves. If you’ve over committed yourself or promised more than you can deliver, you’ll have to pull back and prioritize. Whatever section of our chart Saturn visits is where we are forced to slow down, concentrate, focus and ‘get real’. It may seem that we have limited opportunity during this time but it is really a time of consolidation. Saturn in Sagittarius can have us working very hard for our future goals and we may be able to manifest some of them during this period. We just can’t rely only on luck or faith at this time, we’ll have to put the time and effort in. Shortcuts are not permitted at this time. During Saturn’s trek through Sagittarius, our optimism could take a beating and faith could be tested. It doesn’t mean that we won’t pass the test but that we’ll have to work hard to prove it’s something worthwhile and enduring. It may also be that the things that you believed to be true for you may be in for a bit of an overhaul. Now, you will start to form opinions based on experiences rather than assumptions. You can now gain the wisdom of experience. It may also be that we learn our lessons and are focused in the areas of Religion, Legal issues, long distance travel, higher education, or publishing all of which fall under the domain of Sagittarius. Sag’s ruler Jupiter, has been in fellow fire sign Leo since July providing creative or romantic opportunities and perhaps has us even pushing our luck and taking risks. Saturn comes along into Sagittarius and helps to temper that energy, enabling us to slow down and to make the most out of any of these opportunities that come our way so that we may have real and solid gains as well as gaining experience at this time. Enjoy this New Moon and Happy Holidaze to all! This Full Moon in Gemini is the last Full Moon of 2013. It may have us in a talkative and social mood. Or there may be a lot of inner chatter going on. It could be our moods and plans may be changing rapidly as we are moving from here and there and everywhere. It is a busy time of year so we may be running errands and sending cards and packages etc. It may also be that a communication issue or a certain line of thought or a conversation reaches a turning point during this time. Full Moons shed light on things so it could be that new facts or information changes plans too. This Full Moon in Gemini is quincunx Venus in Capricorn. There may be changes in social schedules, get togethers and parties. In relationships, it could mean that a ‘heart to heart talk is needed to set things right. 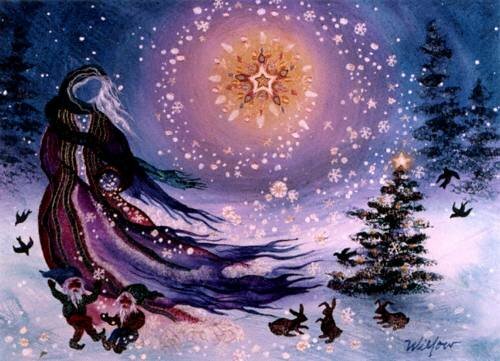 On the Winter Solstice, December 21, Venus in Capricorn will turn retrograde until January 31, 2014. At this time, we may need to re-evaluate our wants, desires, relationships and ….gulp….our finances. Venus in Capricorn is already a ‘no-frills’ kind of energy. She’s all business here. The Universe seems to be giving us this opportunity right around the holiday season to get us more in touch with what and who matters. At this time of gift giving and celebration, it will be about quality vs. quantity. Capricorn rules time, and you may need to re-evaluate how you’re spending yours and with whom and whether or not they or it are worth it. Capricorn also governs over our careers and during this time we may also have to re-evaluate it. Are we doing what we love? Is there any appreciation or compensation coming our way? Or do we feel under-valued? Or are we just wasting our time? These are some of the questions we may be asking now. Venus retrograde is also not a good time for entering into new relationships; business or otherwise unless it is with someone from your past. With Venus retrograde, it is common to cross paths with someone from your past. Uranus, the radical, revolutionary of the Zodiac stations Direct today. Uranus has been retrograde since July 17. Whichever sector of your chart that Uranus is currently transiting is an area that we’ve wanted to change; now those changes may start to move us forward. Jupiter in Cancer is trine Saturn in Scorpio indicating that while we are moving beyond the past, we can take the lessons we’ve learned from it to build a solid future. Jupiter gives the urge to wander and to grow and Saturn sets the boundaries. When they are working harmoniously with each other as they are now, we can move forward slowly and cautiously. With Mercury in Sagittarius also entering the mix, we’re adjusting and setting our sights on the future and making plans for it. We may be tweaking some of our former beliefs to be more in accordance with the big ideas or lengthy conversations we’ve had lately. Mars in Libra is moving in closer to an opposition to Uranus in Aries. This is a very volatile aspect and will be exact just in time for Christmas Dinner and will move in to square Pluto in time to ring in the New Year. This makes plans and get togethers very unpredictable. If your usual gatherings with family are a bit contentious, you could anticipate an all-out free for all. If you have your heart set on a desired outcome, be prepared to make many changes and adjustments. With these kinds of aspects, you can ‘expect the unexpected’. Please don’t kill the messenger as I am only trying to warn you. It may not be as bad as that, maybe it’s a weather inconvenience that changes plans. Maybe you are doing something differently this year than you’ve done on previous years. It could be that you’re spending these holidays with new or different groups of people such as a different side of the family or in a different location. These are just a few out of a zillion possibilities. If it is at all possible you may want to keep things lose and light and spend a quiet evening at home or with just a few close people. I want to wish everyone a Happy Holiday and Happy New Year! I’d also like to personally thank everyone that has read, subscribed, shared and supported Spellbound and Tales of Lunacy all throughout 2013! Thank You! And may the stars always shine upon you all!